IMPlus All-in-One Messenger Pro Chat with award-winning IM+ Pro® within AIM®/iChat, MSN®/Windows Live™ Messenger, Yahoo!®, ICQ®, Jabber®, Google Talk™, MySpaceIM, Facebook® and even Skype™* regardless of location and mobile operator. Now with Twitter* support! •Communicate with all your friends in a single buddylist, share your files and photos. •Follow your friends on Twitter, view timeline, favorites, direct messages and replies, and post pictures and voice messages to your own timeline! •Send your current location to your contacts while chatting or as a status message! •Subscribe and enjoy unique speech recognition option for iPhone/iPod Touch and BlackBerry! 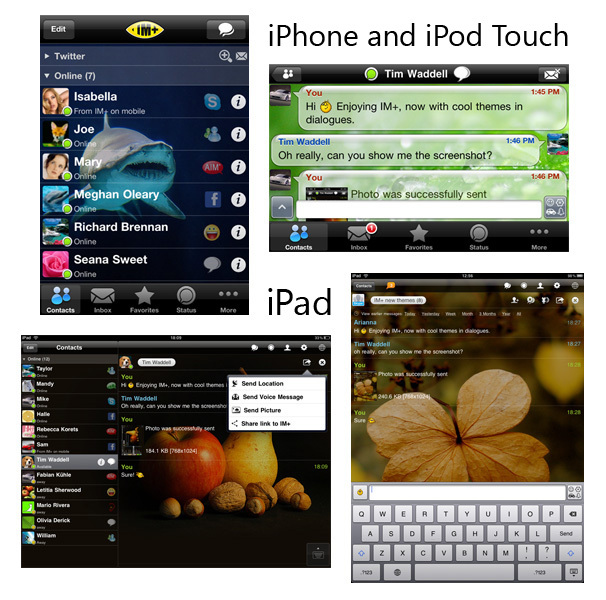 IM+ Pro is available for iPhone/iPod Touch/iPad, BlackBerry, Windows Mobile, Android, Symbian, Java and Palm webOS smartphones. New! Full BlackBerry OS 6 support! New! Now you may also access your Blackberry IM history in IM+ Web Messenger at https://plus.im from your desktop computer. * Skype and Twitter are available in iPhone/iPod Touch/iPad, BlackBerry and Windows Mobile. This product uses Skype™ but is not endorsed or certified by Skype. Third party trademarks, trade names, product names and logos may be the trademarks or registered trademarks of their respective owners. 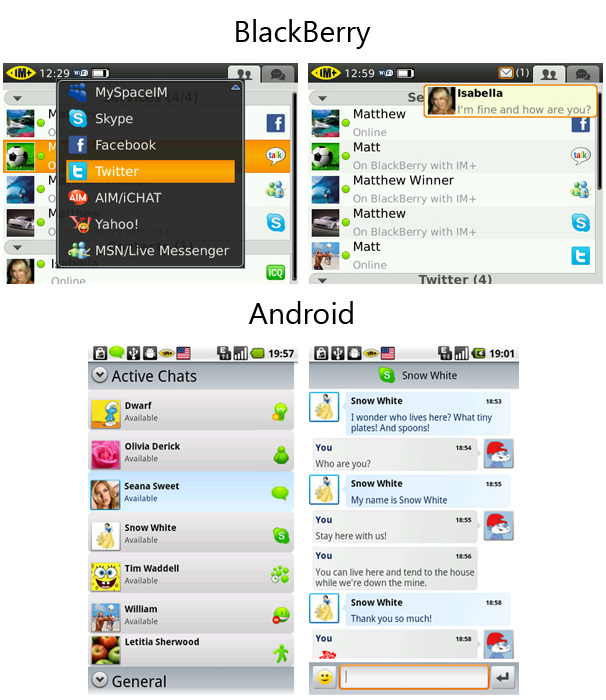 IM+: MSN, Facebook, Skype, GTalk, AIM, ICQ, Yahoo!, Jabber, Twitter and more!